Communicate: wifi is throughout the yacht put does draw off 'hotspots' onshore within a 5 mile range. Sat phone. Marques has been the captain of Matau for the past three years. He took over in Bermuda and has sailed Matau halfway around the world to where she now resides in the South Pacific. Starting his sailing career almost 25 years ago and becoming a SCUBA instructor 13 years ago, he is a person who is truly connected with the Ocean. Becoming a professional captain in 2006, he has been pursuing a sea-based career his entire adult life. Marques and his wife Teal are avid adventurers who are living their dream sailing Matau around the world, and kite-boarding remote areas along the way. Committed to service, Marques prides himself on giving you the best trip of your life. Whether your looking for hidden snorkel or dive spots, secluded beaches, isolated anchorages, the perfect wave, heavy winds or a good party every night, he will pull out all the stops to give you the perfect charter experience. After being in this industry for over a decade Marques knows how to deliver the charter youve always dreamed of. Teal is one of the happiest and kindest people you will every meet. Her ever-positive attitude is truly contagious. She grew up in the wilderness of Alaska and moved to the Virgin Islands in 2006 where she met her husband Marques Hall. Growing up in a family-run inn, Teal has literally been involved in the service industry since day one. When she realized that taking care of guest is what she truly enjoys, she applied her years of experience to earning a degree in hospitality from the University of Northern Arizona. You will never want for anything or have to lift a finger when Teal is taking care of you. Teal is a certified SCUBA diver, kite-boarder, marathon runner and expert hiker, she is always happy to help you plan the perfect day. Debbie hails from the island of Malta, a tiny speck in the Mediterranean Sea. She discovered her passion for creating fine cuisine while working in restaurants while attending university. After graduating with a degree in English, Debbie moved to England to work at Jamie Olivers restaurant, Jamies Italian. She was eager to see the world and when a chefs position came up on a sailboat about to cross the Atlantic she sign on instantly. We met Debbie in Grenada to have her aboard for a trial weekend of cooking and feel in love with her food. She has a wide range mixing different cooking styles and adding a bit of Mediterranean flare to many dishes. She has now been with us for over a year and continues to wow her guests and the owners with exceptional food. Debbie plans to open a restaurant of her own one-day using all the local culinary experience she is gaining sailing around the world on Matau. Debbie is also a certified SCUBA diver. 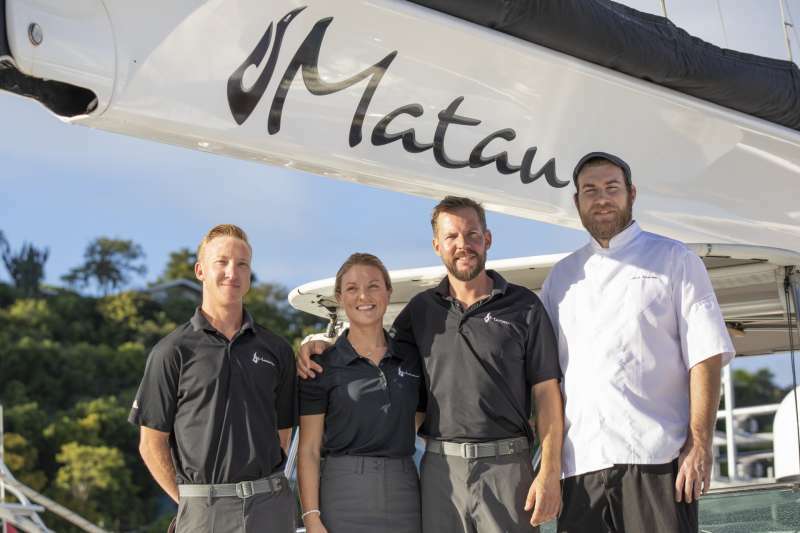 Ben is an exceptionally talented engineer who not only keeps the exterior of Matau spotless but also keeps her mechanical systems running in peak condition. We have been lucky to have Ben aboard for over a year. As soon as he stepped foot on Matau he went to work improving her overall condition. Ben completed a 5-year apprenticeship in his home country, England, before moving to Australia to work on farm equipment all over the country. After a year down under, Ben realized his potential to combine his skill for mechanics and love for travel into a career in yachting. After working for a year in the Med, then moving to the Caribbean, Ben gained an excellent reputation as a guy who could fix anything afloat. Ben enjoys participating in cross-country rally car races, motorcycle trips, SCUBA diving, and kite boarding.